The Trogoniformes are insectivorous or frugivorous arboreal birds which occur in the tropical and subtropical regions of continental Africa, Asia, and the New World. Trogons are the only avian group in which the second toe is permanently directed backward. This so-called heterodactyl foot is accompanied by a plantarly retroverted tarsometatarsal trochlea for the second toe. Skeletal remains of several individuals of early Eocene trogons were collected by Michael Daniels in the London Clay of Walton-on-the-Naze. These as yet unde-scribed specimens were mentioned earlier (Mayr 1999a), and a completely preserved tarsometatarsus shows a plantarly deflected trochlea for the second toe. The earliest formally described specimen is a cranium from the Fur Formation in Denmark, which was assigned to the new species Septentrogon madseni by Kristoffersen (2002b). The cranium of S. madseni shares the presence of basipterygoid processes and a derived morphology of the zygomatic process with crown group Trogonidae, from which it differs in a proportionally narrower nasofrontal hinge. A complete but poorly preserved skeleton of a trogoniform, ?Primotrogon pumilio Mayr, 2005, has also been identified in Messel (Mayr 2005k), and is likewise distinguished from crown group Trogoniformes in the shape of its narrower beak. The heterodactyl position of the toes is clearly visible in this specimen. Weidig (2003) reported a putative trogon from the Green River Formation, which would be the only Paleogene fossil record of this avian group in the New World. Articulated skeletons of unambiguously identified early Oligocene trogons were described from Matt in Switzerland (Olson 1976) and the Luberon in France (Mayr 1999a, 2001e). An isolated wing is also known from the early Oligocene of Wiesloch-Frauenweiler (Mayr 2005k). 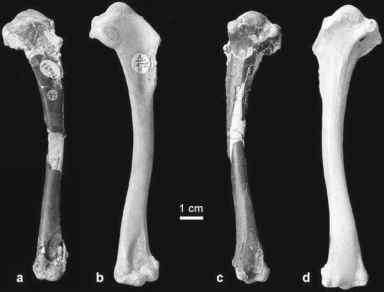 The Luberon trogon, Primotrogon winter-steini Mayr, 1999, is represented by two skeletons which allow recognition of the heterodactyl foot. It was shown to be outside crown group Trogoniformes by its plesiomorphic skull morphology (the cranium and beak are narrower than in crown group Trogoniformes and the orbitae are proportionally smaller) and the absence of derived characters of the coracoid (Mayr 1999a, 2005k). Both P. wintersteini and ?P. pumilio are further smaller than their extant relatives. The fossil record indicates that trogons underwent relatively little morphological changes during the past 50 million years, and suggests a Northern Hemisphere origin of the group and subsequent dispersal into South America during the Cenozoic.